When reviewing job descriptions, more likely than not, a top requirement will include excellent communication skills. Recruiters and hiring managers will want to see that you have strong verbal, listening, writing, and nonverbal communication skills. These types of skills aren’t just necessary for career success, but they are imperative throughout your job search as well. 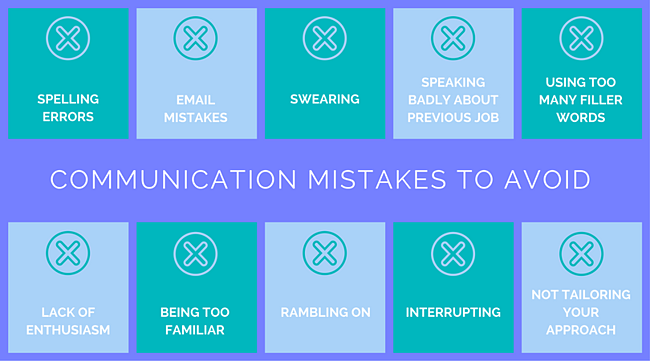 In order to present yourself as a top communicator, be sure to avoid these small mistakes when communicating with a potential employer. The simplest errors to miss are spelling and grammatical mistakes. These can appear in any form of communication with recruiters and hiring managers; whether it be through email, social media messages, or a text. A misspelled word here or a run-on sentence there may not seem like a big mistake in the grand scheme of things, but these small errors can have a large effect on your candidacy. It’s best to just double check every type of written communication before you send it out. In addition to spelling and grammatical mistakes, there are other simple mistakes you can make when sending emails. You may address the wrong person, add the wrong attachment, or hit the send button too early and only have a half written email. The best rule of thumb is to leave your “send to” line blank when first writing your email. After you complete your email and have double checked everything, then add the recipient’s email address so you can avoid any accidental sending. When meeting a recruiter and hiring manager in person, there are a number of social cues to be aware of. One thing that will make you look extremely unprofessional is swearing. These words can slip out every now and then, but you absolutely need to avoid any type of profanity when speaking with a potential employer. You never know how the employer will react to swearing; nor do you want to have one word affect your chances of being hired. Going along these lines, you also should not speak badly about a previous organization, job, or manager in any communication you have with an employer. Instead, focus on the positive experiences, accomplishments, and skills you learned from your last role. You don't want to raise any questions about working with you, so instead emphasize that you're excited about this potential job opportunity and are looking for a new challenge. When speaking, it’s important to be aware of using too many filler words. Filler words, such as um, uh, you know, etc., are commonly used in conversation, but you need to be cautious of how many you use when speaking with an employer. If you notice that you tend to use these filler words when conversing, pause before speaking so you are able to formulate your answer and deliver it confidently. As you go through the job search process, you need to display your enthusiasm for the job opportunity and potential employer. A lack of enthusiasm can make you appear bored or uninterested in the position. If a recruiter or hiring manager doesn’t feel like you’re excited about a role, you may not move forward in the hiring process, regardless of how qualified you are. It’s easy to be nervous during a phone screen or in person interview, however you need to be aware of your presentation and how you sound to someone else. Rambling on or speaking too fast when giving answers to questions will make you appear like you are not in control and can distract from the points you’re trying to make. Practice giving your answers coherently and don’t be afraid of pausing or allowing time for silence. As you continue a conversation with a recruiter or hiring manager in an interview, it’s great to build rapport and get along. Nevertheless, you need to remain aware that you are still in an interview setting and can’t get too familiar with your communication. Don’t forget that you are a professional and need to demonstrate that through your tone. Whether you are speaking on the phone or in person, you have to avoid interrupting your interviewer. If you interrupt or finish the person’s sentence, you’ll appear rude or overly confident. Listening is just as important a communication skill as your verbal skills are. Throughout your job search, you will communicate with different recruiters, hiring managers, and employers. Each person will have varying interests and hiring processes, so you have to tailor each conversation. Personalization is key here, as you will be dealing with many personalities and want to show you’ve done your research on that particular role and organization. These communication mistakes may seem obvious, but you will be surprised how simple it is to forget one or more of them. You don’t want a simple spelling error or interview answer to cost you a chance at a potential career opportunity, so it’s important to be aware of these small slip-ups before you start your job search. Want more advice on how to have a successful job search? 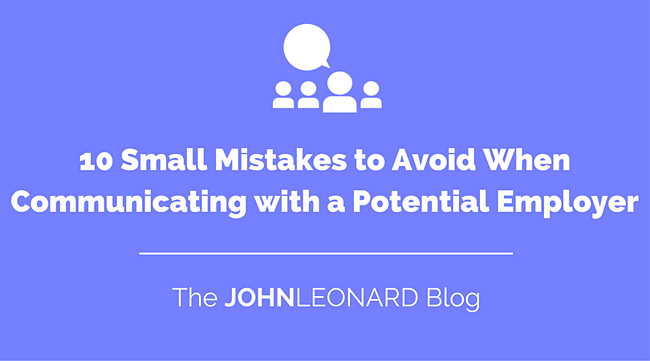 Subscribe to the JOHNLEONARD blog below and you'll receive helpful tips and tools right in your inbox!